Post subject: Mould and Damp Please Help! 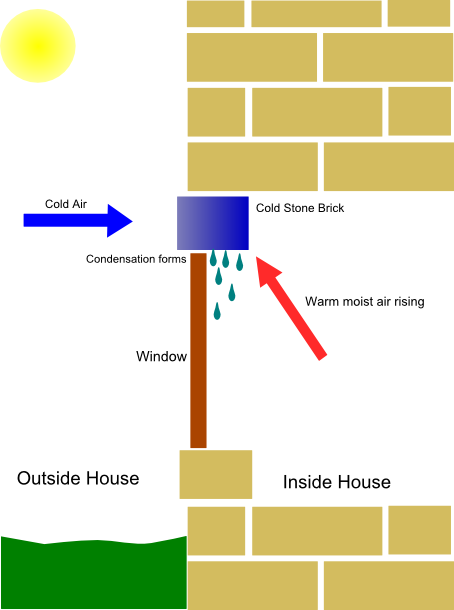 This is basically what is happening in my house - I have a brick lintel which is both inside and outside the house - so it is exposed to the cold air outside and when you touch the brick inside the house it is also freezing. I am new to the forum, and thought it would be the best place to pose a few queries with regards my degenerating bathroom! I have a concrete step, inside my house, which misses the DPM below. There is the risk that it could pull up humidity. Does anybody know which product I could use -paint or similar- to make a waterproof barrier by applying it on the concrete and on which I could fix tiles? or is there a waterproof tile adhesive I could use as if it was an exterior application? I currently rent an ex MOD property which my landlord says has had cavity wall insulation installed before he bought it. I can't see any evidence of this so how can I tell if cavity wall insulation has been installed? I live in the downstairs flat so have no access to the loft to try and see down into the cavity and can't see any evidence of rows of drilled holes. We have a stud wall separating ashower from a built-in wardrobe. Water from the shower has penetrated the grout and saturated the plasterboard shower-side. The plasterboard on the wardrobe side seems okay, but there is a strong smell of damp in the wardrobe which makes it unusable. There are no visible signs of damp. Correct way to paint smooth cement render? Internal/Extern..